Looking for a meal to tickle your tastebuds? 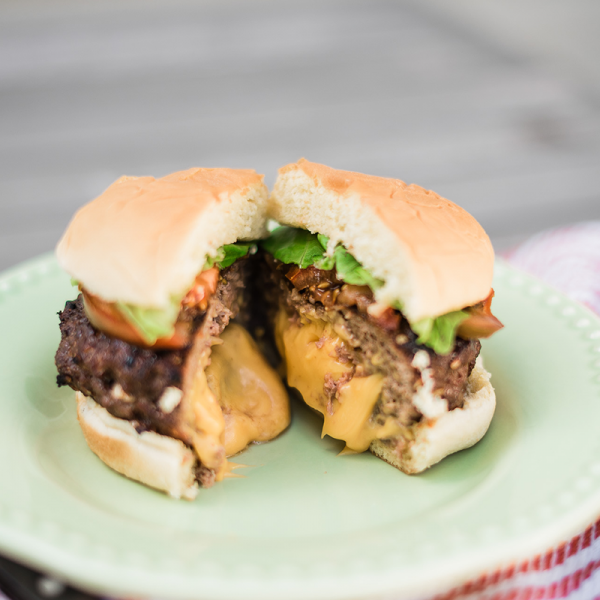 This Juiciest Lucy takes the traditional burger and makes it oh so irresistible with gooey cheese stuffed inside. The heat of the burger melts the cheese, making it just plain amazing! Juicy Lucys are easy to customize. We’re using American cheese, but you can try pepper jack for a spicy kick, mozzarella for some Italian flare or Gouda for an elegant backyard main. You know what else is amazing? Beef that comes from South Dakota farms and ranches. Marc Reiner, from Tripp, feeds his cows a balanced blend of hay, silage and soybean meal made from the crops he grows. The feed is mixed with vitamins and minerals to ensure cows stay healthy, which translates to nutritious meat for your family meals. Watch our step-by-step instructional video to learn how to transform your burgers into juicy, cheesy masterpieces! See full recipe below. Keep the local flavor going with Dimock Dairy cheese. Here’s the scoop on how it’s made. Mix ground beef with French onion dip seasoning. Form 4 thin burger patties. Place American cheese in between 2 burger patties and make sure edges are sealed. Place on grill for 4 minutes. Flip and grill for another 3-4 minutes or until burgers reach desired temperature. Place burger on potato bun. Top with tomatoes, lettuce, ketchup and mustard. Enjoy!